Hamels and Pray for Rain and Pray for More Rain? David Bote’s pinch-hitting heroics on Sunday night ensured that Cole Hamels‘ sterling start did not go to waste, but for the rest of the Cubs’ rotation, such outings have lately been more the exception than the rule. On Tuesday afternoon against the Brewers at Wrigley Field, Jose Quintana dug his team a three-run hole in the first inning, serving up a leadoff homer to Lorenzo Cain on just his second pitch of the afternoon and, three batters later, allowing a two-run blast to Ryan Braun. Two innings later, Braun added another two-run shot. Last Saturday, it was Jon Lester allowing two first-inning runs to the Nationals, and nine in 3.2 innings of a 9-4 Cubs loss. On Friday, it was Kyle Hendricks allowing runs in the first and second innings before righting the ship in a 3-2 win. Lately, it’s always something. The starters are 13th among NL clubs in ERA (5.39) and 11th in FIP (4.85) since the All-Star break. The trouble has begun almost immediately; in the first inning, the starters have posted an 8.64 ERA (last in the NL) and a 5.84 FIP (12th). The Cubs’ survival and success thus far is testament both to their offense, which is cranking out 4.88 runs per game (second in the league) with a 103 wRC+ (first), and to their bullpen, which is second in the league in ERA (3.35) and fifth in FIP (3.84), though the latter unit has been mid-pack thus far in the second half. But whether it’s the added stress of so many postseason innings, the impact of the change in pitching coaches from Chris Bosio to Jim Hickey, or the difficulty of their newcomers in acclimating — and it could well be some combination of all three — the Cubs can’t be brimming with confidence in their costly, underperforming rotation as they look towards September and October. Hamels, with a 1.00 ERA, 1.94 FIP, and 29.0% strikeout rate in three starts since being acquired from the Rangers, is the exception; Edwards has a breakdown of the 34-year-old southpaw’s ace-like performance here. Yes, the 2006 Cardinals (who won just 83 games) and 2014 Giants both went on to win the World Series, but just 38 teams out of 656 in the 1996-2017 span even managed to post records above .500 despite a FIP- of 104 or higher, and just six out of 656 did so with a 110 or higher. Hamels aside, the members of the Cubs’ starting cast, whether healthy, injured, or exiled to the bullpen, are worth a closer look. Back on June 26, I wrote about Lester’s high-wire act, pointing out that the gap between his 2.10 ERA and 4.19 FIP was on track to be the largest by an ERA qualifier since 1901. Since then, the 34-year-old lefty has been tarred and feathered for a 7.51 ERA and 6.59 FIP, with 12 homers allowed in 44.1 innings; in only two of those nine starts has he lasted longer than five innings. What gives? Basically, Lester is throwing fewer sinkers than last year (4.9%, down from 12.3%) and replacing them with four-seamers (45.8%, up from 38.4%). According to Brooks Baseball, the horizontal movement on his four-seamer has shrunk from an average of 6.23 inches to 4.73, his lowest since his 2007 rookie season. Both his strikeout rate and his ground-ball rate have plummeted (from 23.6% to 18.4% for the former, and from 46.2% to 37.0% for the latter). Batters are elevating the ball and making much more solid contact against him; his xwOBA has jumped from .308 last year to .371 this year, which is in the 92nd percentile among pitchers who have thrown at least 1,000 pitches this year. Lester may not put much stock in analytics; right now, analytics doesn’t put much stock in him, either. Hendricks’ ERA has risen by a run relative to last year, though his FIP is just 0.38 higher; his home-run rate (1.3 per nine) and strikeout rate (20.0%) have both crept in the wrong direction, but he’s walking fewer hitters, so his 14.1-point K-BB% is within half a point of last year’s mark. His 85.4 mph average exit velocity ranks ninth among pitchers with at least 200 batted-ball events, but he’s simply been less successful against batters with men on base relative to last year (.241/.310/.432 this year, .204/.274/.376 this year). His sinker is getting less sink, and it’s been far less effective than in years past; batters are hitting .303/.357/.456 for a 127 wRC+ against it this year (228 PA) compared to .219/.278/.319 for a 65 wRC+ (210 PA) in 2017. Quintana’s 21.8 WAR from 2013 to -17 ranked sixth in the majors, 0.7 ahead of the seventh-place Lester, but right now he’s in the midst of a dreadful season. The 29-year-old righty’s ERA, FIP, home runs per nine (1.44), and walk rate (10.5%) are all career worsts, and the damage might be even greater if not for a career-low .278 BABIP. While he posted a 3.33 ERA over a 14-start span from May 4 through July 22, his 4.66 FIP in that timeframe shows suggests it was a mirage; he’s been roughed up on either side of that stretch, and has allowed 17 runs in his last four starts, totaling 20.1 innings. Like Lester, Quintana is throwing fewer sinkers than last year (18.6%, down from 27.3%) and more four-seamers (48.7%, up from 35.5%), and getting much less movement on the heaters, an average of 3.34 inches this year compared to 3.96 last year and 4.59 in 2016. He’s getting less vertical movement on both that and his sinker — and actually, it’s fair to say he’s getting less movement in both planes on everything except his curve. Has the workload caught up to him? Filling in for the injured Yu Darvish since late May, Mike Montgomery has been the rotation’s unsung hero. His numbers above are as a starter; as a reliever he’s been replacement-level lousy this year (5.13 ERA and 4.30 FIP in 26.1 innings). He doesn’t miss many bats; his 14.4% strikeout rate is the third-lowest among all pitchers with at least 90 innings, ahead of only Ty Blach and Bartolo Colon, but his 0.63 homers per nine and 52.8% ground-ball rate are both in the 92nd percentile or above among that same group. As a contact-oriented pitcher, he’s in good shape in front of a strong infield defense. Signed to a six-year, $126 million deal this past winter, Darvish has endured a rough introduction in Chicago. He failed to last five innings in five of his eight starts, getting the hook in mid-fifth four times and departing due to a leg cramp once — that after serving a disabled list stint due to parainfluenza virus. With both his repertoire and mechanics subject to repeated tweaking since last summer’s trade from the Rangers to the Dodgers, the bottom line has been fewer chases outside the zone (26.0%, down from 30.3% last year), fewer swinging strikes (11.1%, down from 12.3%), and more solid contact (.335 xwOBA, up from .297). Just when it appeared he was getting it together, with a strong six-inning start on May 20, he landed on the DL with triceps tendinitis and was later diagnosed with elbow impingement as well. After throwing a three-inning, 55-pitch simulated game on Tuesday, he’s likely to head out on a rehab assignment, with an eye towards returning in late August or early September. The first year of Darvish’s deal hasn’t worked out, and the same is true regarding the three-year, $38 million deal the team gave Tyler Chatwood. The 28-year-old righty has struggled with his mechanics and his control, walking an NL-high 90 batters in 99.2 innings. His 19.3% walk rate is the majors’ highest among pitchers with at least 90 innings since 1988, and it’s higher than his strikeout rate (18.2%). If not for his high ground-ball rate (53.4%) and low home-run rate (0.81 per nine), his ERA might be confused with a Boeing airplane. Sent to the bullpen with Hamels’ arrival, he’s walked five in 5.2 innings of relief, so it’s not like he’s suddenly finding himself. At best, the Cubs appear to have three average-or-better starters right now in Hamels, Hendricks, and Montgomery, with Lester and Quintana both flailing and a whole lot of pressure on Darvish to return with his All-Star-caliber form intact. 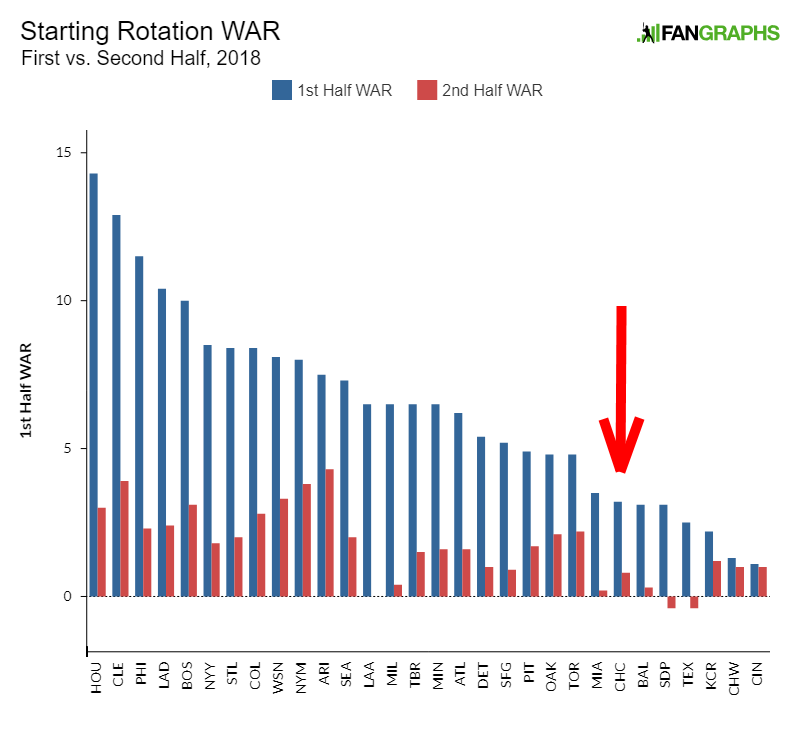 With Hamels in the fold and the farm system in rough shape (Baseball America recently ranked their organization 28th), they can’t expect a waiver-period deal to right the situation, and once Darvish returns, the matter of who moves to the bullpen isn’t worth worrying about. You can’t have too many chickens before they hatch, or something like that. In the meantime, it appears that manager Joe Maddon, Hickey, and the Cubs brass have a whole lot to sort out with their struggling starters. Whether it’s mechanics, repertoire, or approach, there’s too much talent for this team to be this far off the mark at this stage. We hoped you liked reading Hamels and Pray for Rain and Pray for More Rain? by Jay Jaffe! I left a bunch of similar attempts on the cutting-room floor but the Hamels/camels ones were by far the funniest.